Klein Sun Gallery is pleased to announce Everything Comes With an Expiry Date, a solo show of paintings by Chow Chun Fai, on view from October 13 through November 12, 2016. Chow Chun Fai is among the generation of artists influenced by the return of Hong Kong to mainland China in 1997. Working as an artist for over 10 years, Chow is also a political activist on many of the sociopolitical issues present in Hong Kong. He is a member of the Factory Artists Concern Group, and also the chairman of the Fotanian Artist Village, an artistic collective in the Fo Tan industrial zone in Hong Kong. In 2012, Chow ran, albeit unsuccessfully, for the cultural post in the Hong Kong Legislative Council as an artist, further demonstrating the artist’s devotion to Hong Kong’s social and political movement. Chow immersed himself in the local life of Hong Kong when he was a taxi driver for approximately 8 years. 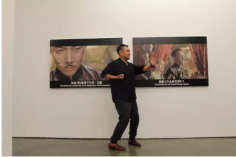 This experience led to the abundance of taxi cars in his earlier paintings, and also spawned his documentation about the political transformation in Hong Kong, which is presented in this exhibition through his “Movie Painting” series. Inspired by Italian composer Italo Calvino’s viewpoint on classics as “books which exercise a particular influence, both when they imprint themselves on our imagination as unforgettable, and when they hide in the layers of memory disguised as the individual’s or the collective unconscious,” Chow appropriates various scenes and relevant subtitles from Hong Kong films, and re-contextualizes the the city’s iconography, as well as its complex historical narrative since the 1970s. 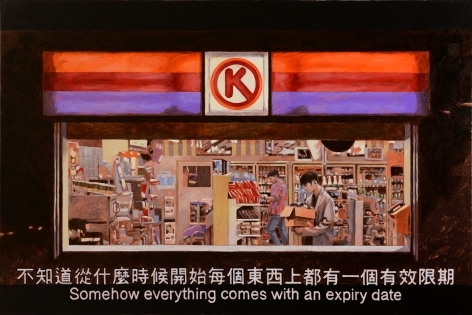 In Chungking Express, “Somehow everything comes with an expiry date" (2016), one of the paintings shown in the exhibition, the artist painted the highly recognized movie still in which the protagonist says “somehow everything comes with an expiry date” while mourning for his lost relationship. Reiterating the uncertainty and melancholy portrayed in Chungking Express, the artist alludes to the societal tension before the 1997 handover. Created in 2016, the artist touches upon the territory’s anxiety towards the “One Country, Two Systems” policy where Hong Kong will officially morph into the socialist system in China in 2047. Capturing a series of stills from classical Hong Kong movies, Chow Chun Fai plays on the in-between status of the city both politically and culturally, expressing the constant confusion and negotiation in the on-going readjustment in search for the identity of Hong Kong. Chow Chun Fai was born and raised in Hong Kong in 1980. He holds a BA and MFA from the Fine Arts Department of the Chinese University of Hong Kong. 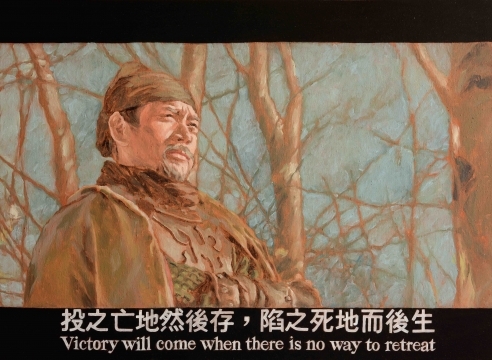 His recent solo exhibitions include, CHOW Chun Fai: I Have Nothing to Say, Hanart TZ Gallery, Hong Kong (2015); Cultural Rights-Artist Running An Election, the Hong Kong University of Science and Technology, Hong Kong (2013); Shanghai Tan-Paintings by CHOW Chun Fai, Aike-Dellarco, Shanghai (2008). He has also exhibited in group shows worldwide including Chinese WhispersRecent Art from the Sigg und M+ Sigg Collections, Kunstmuseum Bern; Zentrum Paul Klee, Bern, Switzerland (2016); The Past Continuing, Hong Kong Heritage Museum, Hong Kong (2015); All Are Guests-Homecoming, Hong Kong Museum of Art, Hong Kong (2015); Light and Shadows - Caravaggio • The Italian Baroque Master, Asia Society, Hong Kong (2015); Hong Kong Eye, Saatchi Gallery, London (2012); Liverpool Biennial, Liverpool (2012); Legacy and Creation - Art vs Art, MOCA, Shanghai (2010); Beautiful Journey-Beautiful World, West Kowloon Cultural District, Hong Kong (2008); and Hong Kong Art Biennial Exhibition 2003, Hong Kong Museum of Art, Hong Kong (2003). Chow Chun Fai is featured alongside other prominent Hong Kong artists in the Culture Trip. Chow Chun Fai's solo exhibition "Everything Comes With an Expiry Date" at Klein Sun Gallery is chosen as one of Artnews"Editors’ Picks: 8 Art Events to See in New York This Week." Chow Chun Fai hopes to expose the New York art world his eastern aesthetic through his solo show "Everything Comes With an Expiry Date," at Klein Sun Gallery.